The Draft.—-The drawing to make up what deficiencies may exist in the quotas of the various districts of this State, did not commence on Monday, nor has any day been yet positively fixed. 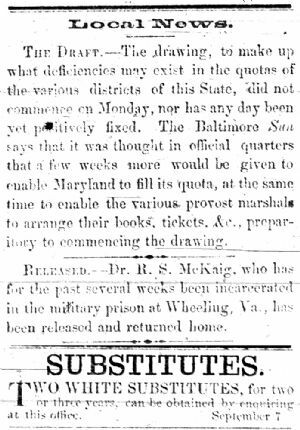 The Baltimore Sun says that it was thought in official quarters that a few weeks more would be given to enable Maryland to fill its quota, at the same time to enable the various provost marshals to arrange their books, tickets. &c, preparatory to commencing the drawing. Released. Dr. R. S. McKaig who has for the past several weeks been incarcerated in the military prison at Wheeling, at Wheeling, Va, has been released and returned home. TWO WHITE SUBSTITUTES. For two or three years, can be obtained by enquiring at this office. September 7.